1. Die cut the stitched square. 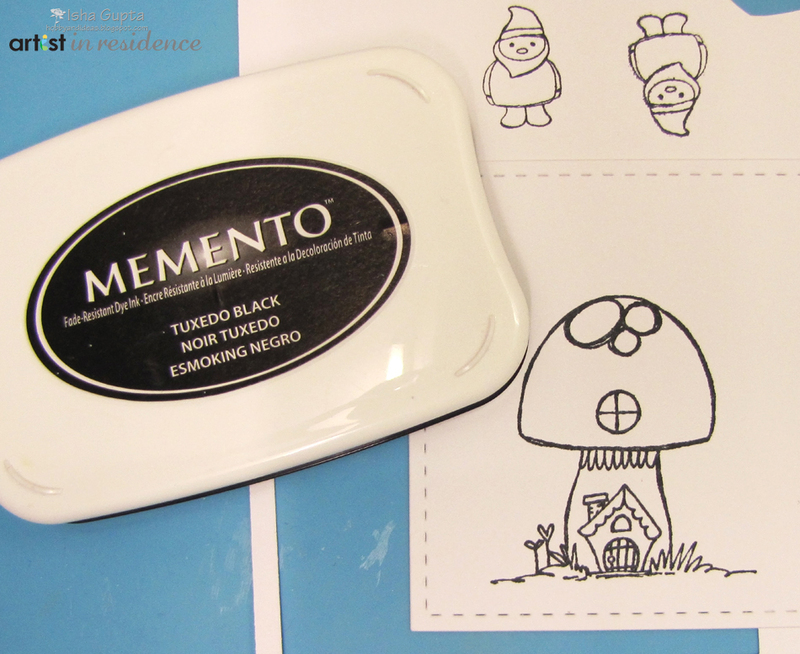 Stamp mushroom with Memento Tuxedo Black. Stamp the Gnome onto a scrap piece of paper. 2. Color the images using alcohol markers. Fussy cut the Gnome image. Extend the grass a bit by using Memento marker. 3. 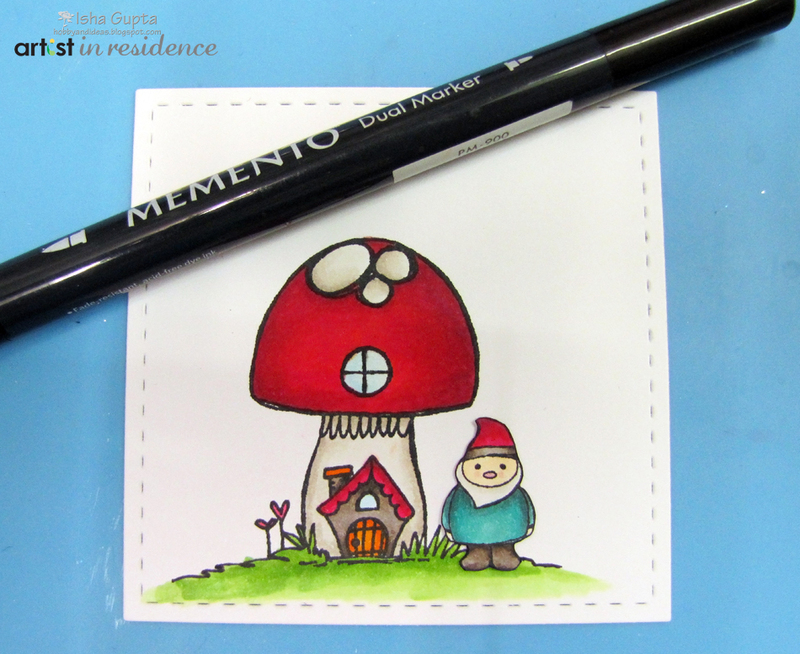 Stamp the mushroom house onto a scrap paper and use it as a mask. Sponge some inks onto the background. 4. Use irRESISTible Pico Embellisher clear onto the door and window glass, black onto the door knob and some neon onto the grass to create tiny flowers. 5. 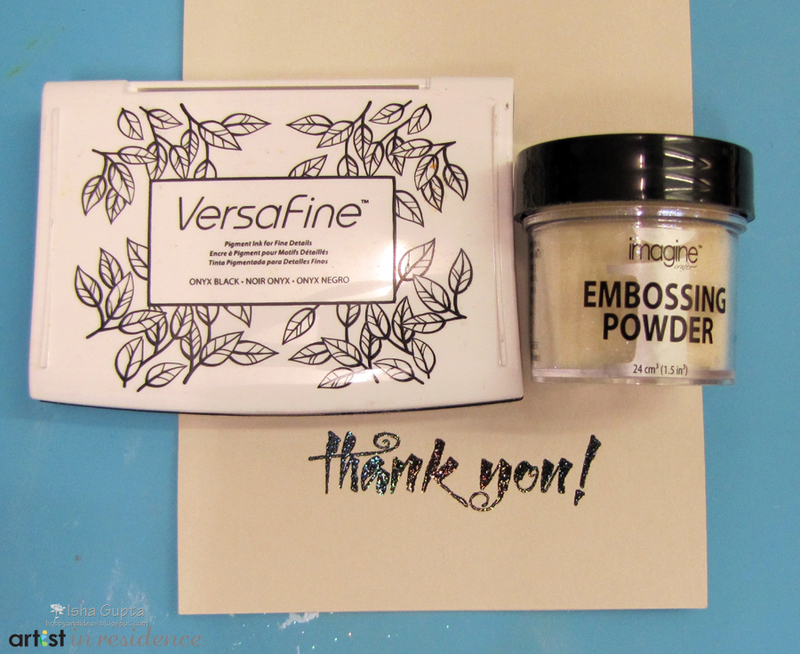 Stamp the sentiment using VersaFine Onyx Black and emboss using iridescent embossing powder. 6. 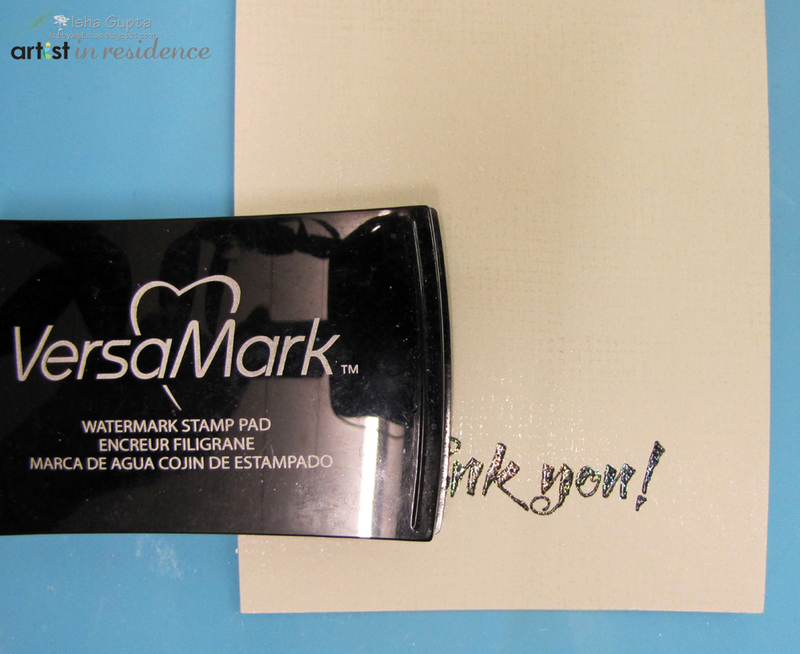 Stamp the background onto the cardbase using VersaMark. It gives a subtle tone on tone look, which gives extra depth to the card. Radiant Neon Electric Blue, Shimmer Spritz Gold, Sponge Daubers. 1. 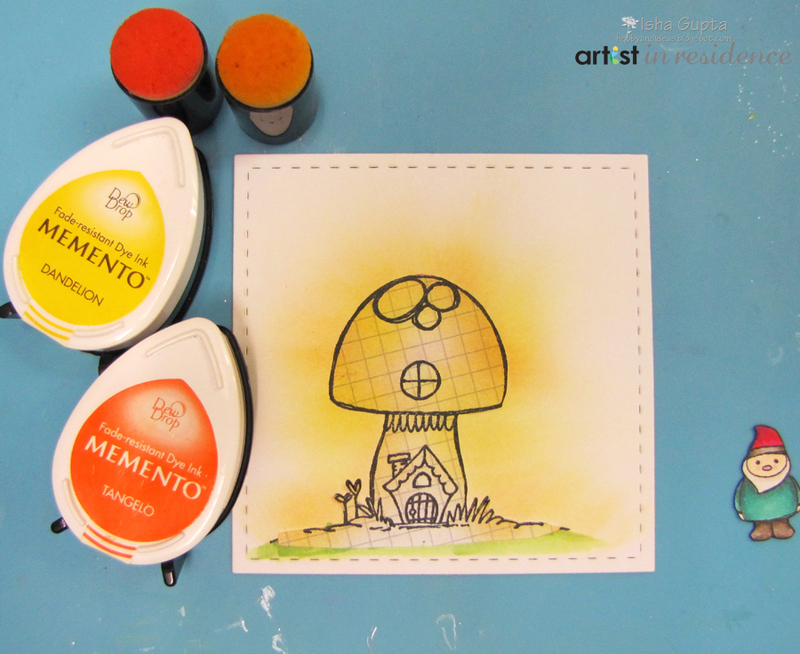 Mount stamp on acrylic block using Tack’n Peel. Stamp image twice on white card stock with Tuxedo Black. 2. Fussy cut out snowman and snow drift from one of the images. 3. Using the acrylic block as a palette, ink the acrylic block with Radiant Neon Electric Blue and then spray with Ink Potion #9. With a Sponge Dauber, color the sky background. Mist with Shimmer Spritz Gold and allow to dry. 4. Fill in stars with Pico Wedding Dress, and the carrot nose with Pico Radiant Neon Electric Orange. 5. Spray irRESISTible Wedding Dress on the cut-out snow drift and sprinkle with Shaved Ice. 6. Spray cut-out snowman with GooseBumps Shimmer. 7. Cut/score card base to desired size. 8. Stamp border around the edges with Radiant Neon Electric Blue. 9. Fill in hearts of the border design with Pico Radiant Neon Electric Yellow. 8. When all pieces have dried, attach stamped image to a pattern paper mat. 9. Use dimensional adhesive to attach the snowman and snow drift. 10. Stamp sentiment onto white cardstock with RadiantNeon Electric Blue and mat onto pattern paper. 11. Cut matted sentiment to size and attach to card using dimensional adhesive. 12. Embellish card with rhinestones as desired. Savannah adds a little bit of VersaMark ink, a touch of embossing powder and some heat setting to take simple greetings to the next level. 1. 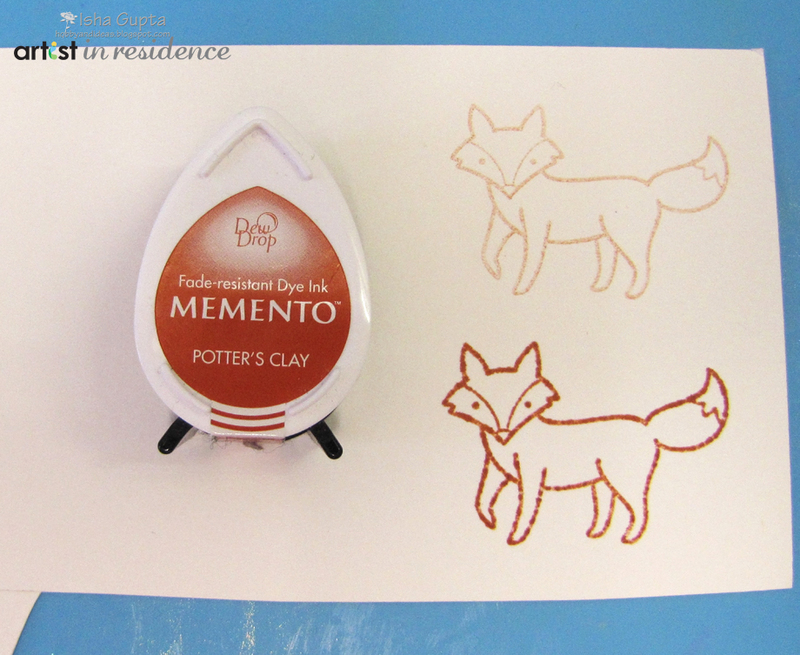 Stamp the image using second generation stamping technique using Memento Espresso Truffle ink. Press the inkpad to the acrylic block and use this as your watercolor to color in the image. 2. 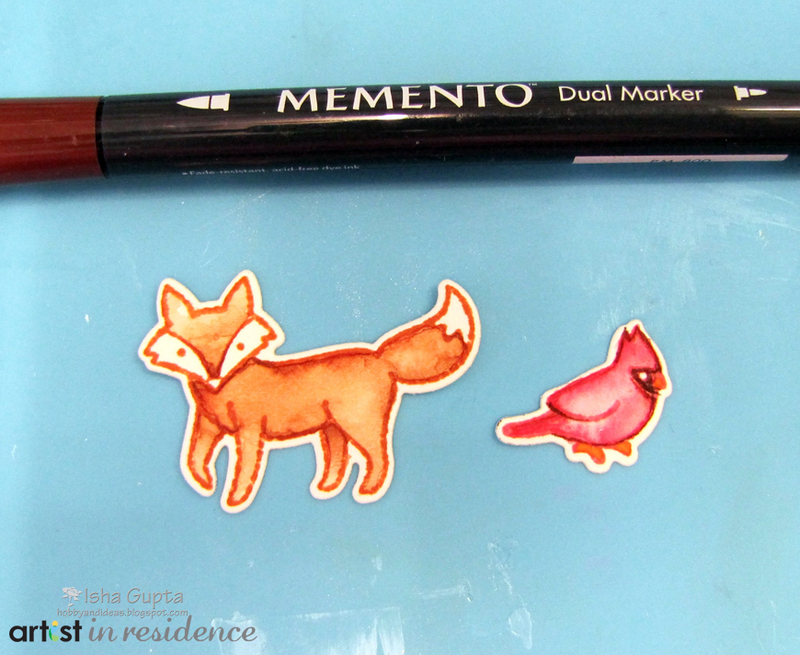 Stamp the fox and the bird and color in the same way as Step 1. 3. Outline the images with a darker color for added dimension using the marker. 4. 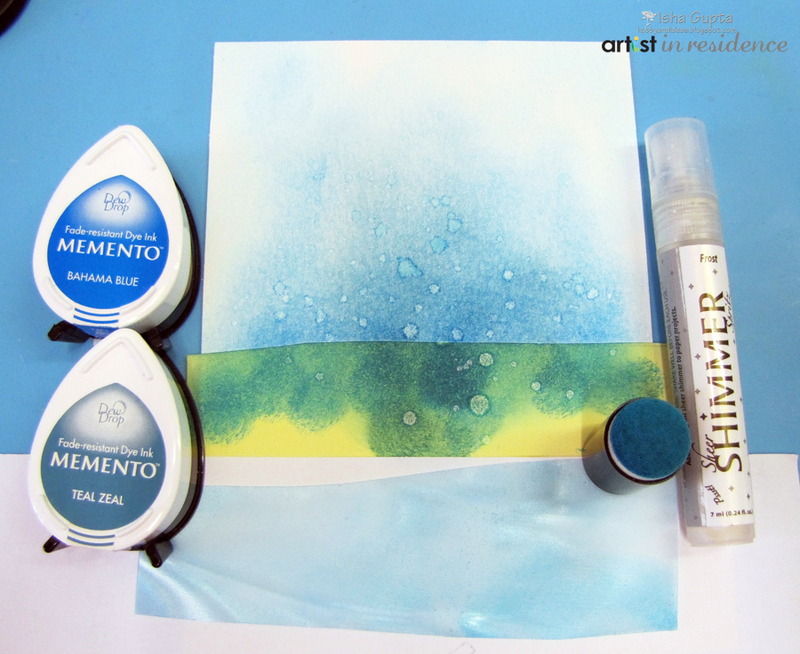 Mask and sponge the blue inks, then unscrew the lid from the Shimmer Spritz Frost bottle and flick the color onto the background. 5. Sponge some ink onto the Vertigo, this will be our water for the scene. 6. 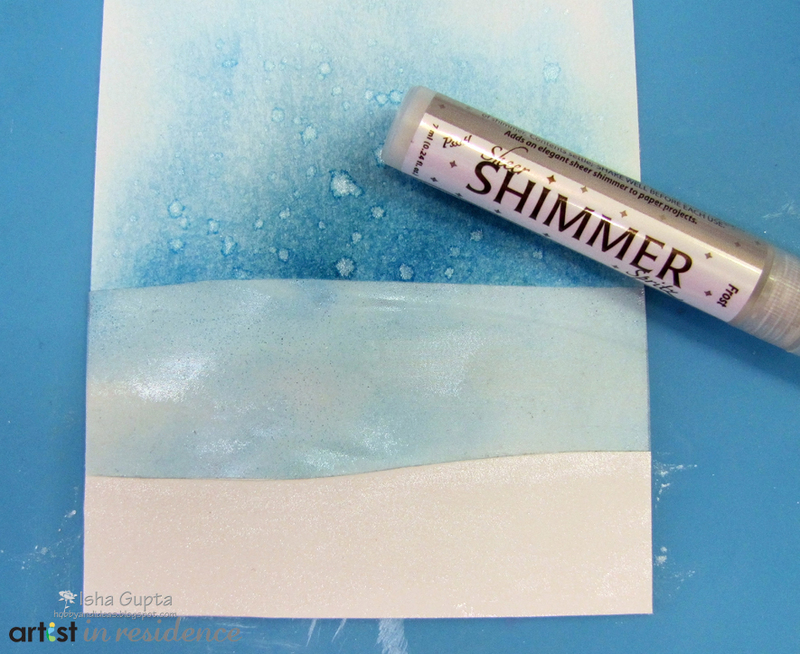 Apply Shimmer Spritz Frost using a Sponge Dauber to the foreground for the effect of ice. 7. Adhere the background trees and fox using liquid glue. 8. With dimensional adhesive, add the foreground trees and the bird. 9. 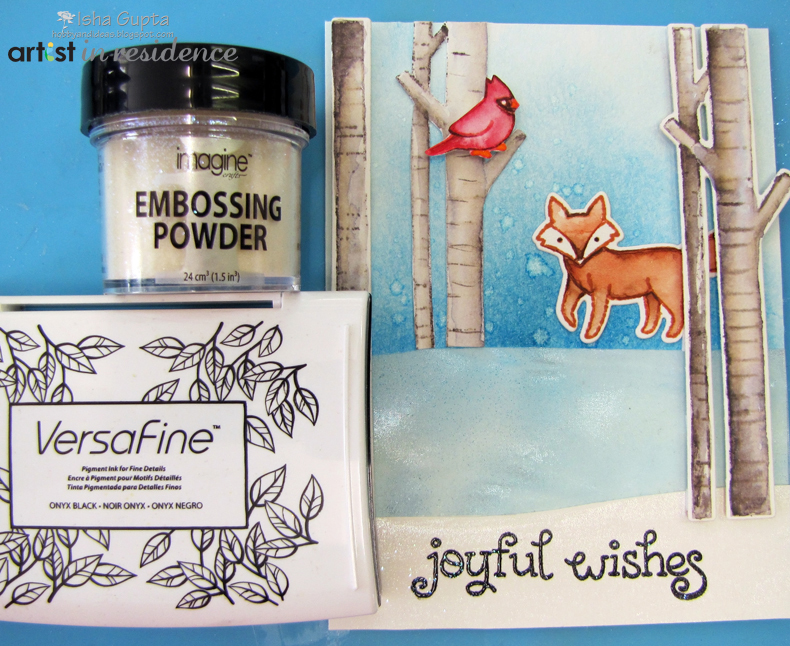 Stamp sentiment with VersaFine Onyx Black and heat emboss using Iridescent Embossing Powder. 10. 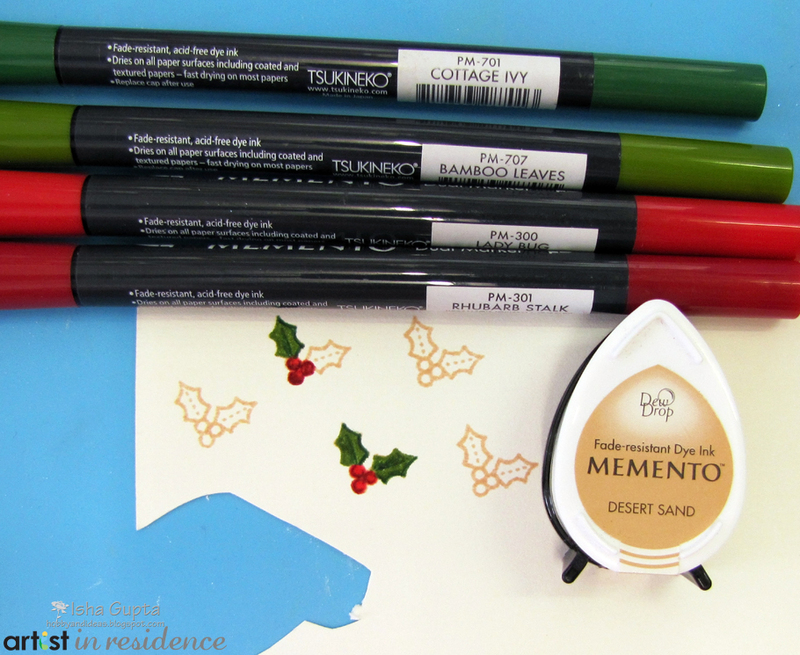 Stamp holly using Memento Desert Sand and color with Memento Markers in Cottage Ivy, Bamboo Leaves, Lady Bug and Rhubarb Stalk. 11. Assemble remaining pieces of the card as shown. 12. 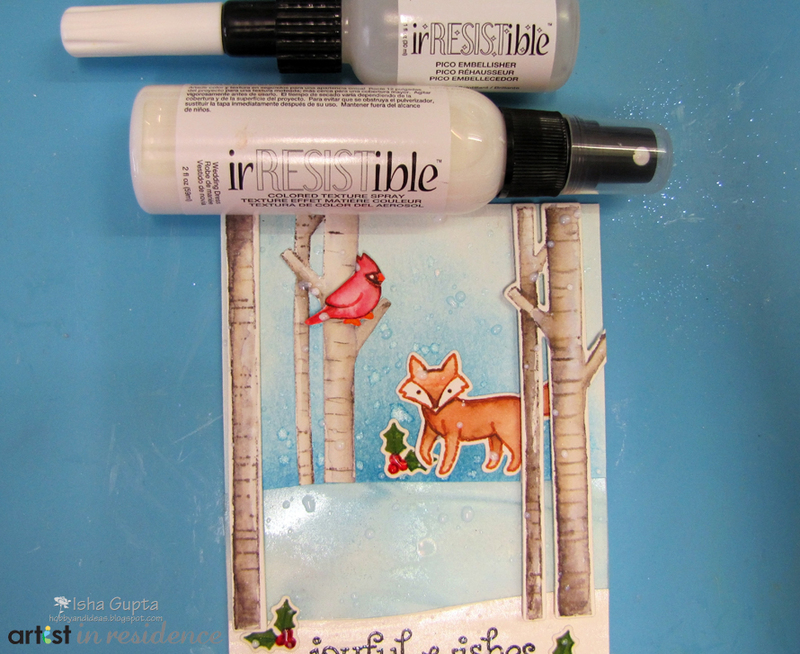 Unscrew the nozzle from the irRESISTible Texture Spray Wedding Dress bottle and sprinkle the liquid onto the card. 13. Apply irRESISTible Clear Pico Embellisher onto the berries and some irRESISTible Wedding Dress Pico Embellisher for the snow on the branches and the ground. 14. Adhere the completed panel to the cardbase using dimensional adhesive. 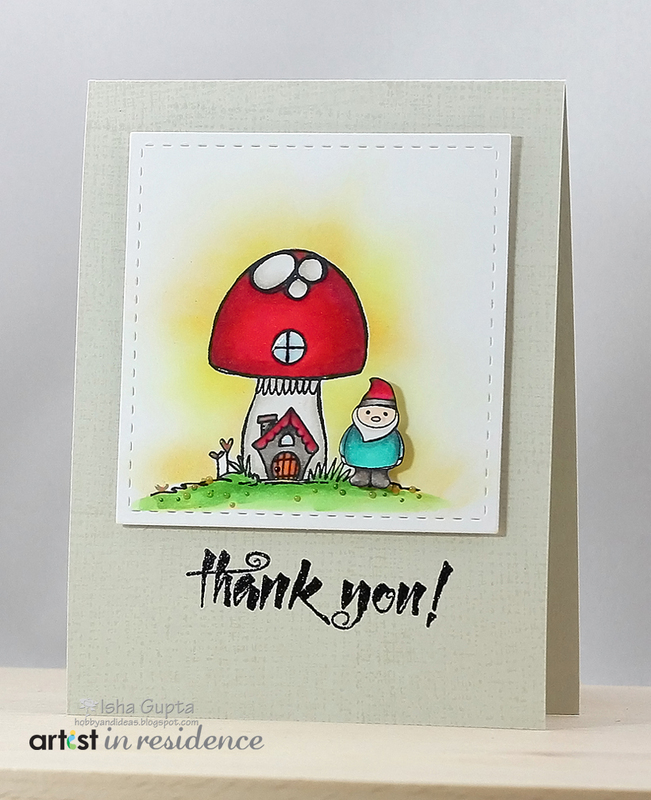 I love these whimsical stamps by Lawn Fawn, they inspired me to create a fun bright 3-D scene, so I decided to create this faux shadow card – so fun ! 1. Cut out pattern paper with the frame die cut. 2. Stamp these cute little critters on to white card stock with Memento Tuxedo Black. 3. 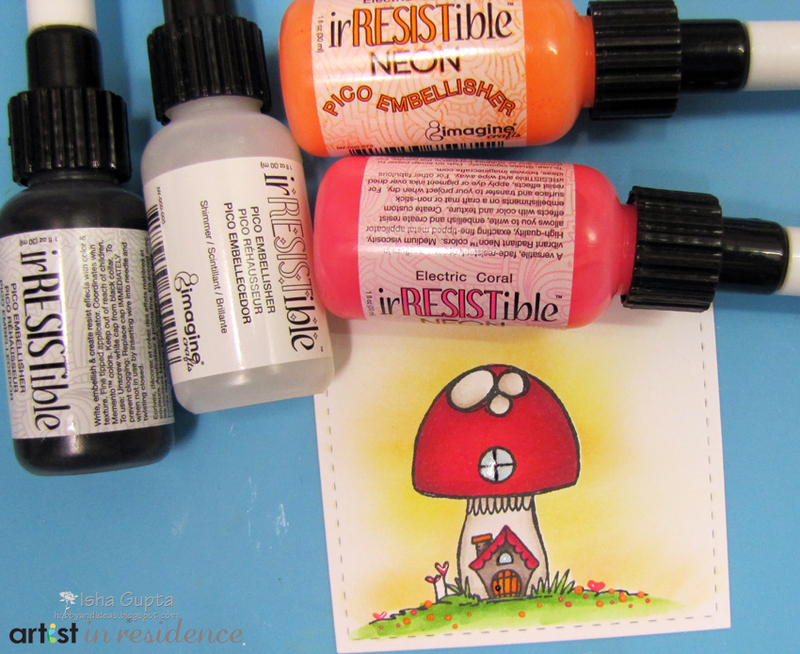 To color, dab a little Memento Rhubarb Stalk, Toffee Crunch, Tangelo, Pear Tart, Rocket Red, Cosmic Copper onto the Craft Mat (using the Craft Mat as your palette). Mist the ink with Ink Potion No. 9 and then use a small paint brush to color the images. 4. Add a touch of irRESISTible Pico Embellisher Wedding Dress to the trees and the fox’s tail for dimension. 5. Cut out your pieces when dry. 6. Cut a piece of white card stock the same size as your frame for the background and color with VersaMagic Aquatic Splash applied with a Sponge Dauber. 7. Line up the white background under the frame and stamp the sentiment and stars. 8. Color the stars with Memento Dandelion Marker. 9. Die cut Vertigo with snow drift die and attach to the bottom of frame on the inside. 10. Place dimensional tape around the frame to create the faux shadow box. 11. Attach frame to the background. 12. Adhere the stamped images onto frame as shown. 1. Cut/score card base from brown cardstock. 1. Die cut leaves from brown cardstock. 2. Using a Sponge Dauber, cover one side of leaves with Brilliance Cosmic Copper. 3. Highlight over the copper color using StazOn inks – I chose to use Orange Zest, St. Valentine and Cactus Green for my leaves. 4. Emboss leaves with a polka-dot pattern with an embossing folder. 5. Highlight the embossed leaves with Delicata Golden Glitz. 6. Cut a piece of white cardstock slightly smaller than the card base. 7. Color this layering piece with a combination of Cosmic Copper and Golden Glitz. 8. Die cut label from from white cardstock and add Cosmic Copper with a Sponge Dauber to highlight. 9. Stamp sentiment onto the label with Delicata Golden Glitz. 10. Assemble the card: add the colored layering piece onto the card base, adhere burlap with leaves and sentiment overlapping, and finish with a bow tied around the stems of the leaves. 1. Using Creative Medium Clear, adhere tissue paper to craft coasters, wrap paper edges to backside and adhere. 2. Using an InkBlusher, cover coaster with Memento Luxe Wedding Dress, once dry, adhere letter stencils. 3. Using an InkBlusher, cover coaster with Memento Luxe Evergreen, making the areas around the letters the darkest. Highlight coaster edges using Delicata Silvery Shimmer. 4. Carefully remove letter mask and stamp Pine Branch with StazOn Olive Green and Timber Brown, alternating locations on each coaster. Using an InkBlusher, highlight coaster sides with StazOn Jet Black. 5. Once dry, cover coaster with Creative Medium Shimmer and let dry completely before use. 1. Adhere tissue paper to the canvas using Creative Medium. 2. Next pick your saying and stick the letter stencil mask to your canvas. 3. Using Sponge Daubers, ink till your happy with the results. I used both VersaMagic and Memento inks to create the vibrant colors. 4. Peel off the stencil letters. Outline the letters and add color using Sponge Daubers. 5. Create flowers from pink polka dot tissue. Punch six circle scallops per flower. Put a brad in the middle to secure and then fluff the petals. 6. Cut a piece of black cardstock to use as a mat under the photo and glue sequins around the edge to add some bling. 7. Punch out some hearts from the tissue paper, then add dimension to the polka dot pattern by filling in the dots with irResistible Pico Embellisher in Wedding Dress. 8. Attach your pieces to the canvas and you have a beautiful piece of art. 9. Sprinkle a few sequins to the canvas for a little interest . I loved using this tissue paper, so with the left over word tissue paper I created this pumpkin! I first inked the word tissue paper with Memento Morocco and then tore it into small strips. With Creative Medium, I decoupaged the colored tissue paper onto a plastic pumpkin from the dollar store. Welcome to a week of fabulous projects featuring the great products from Memory Box! 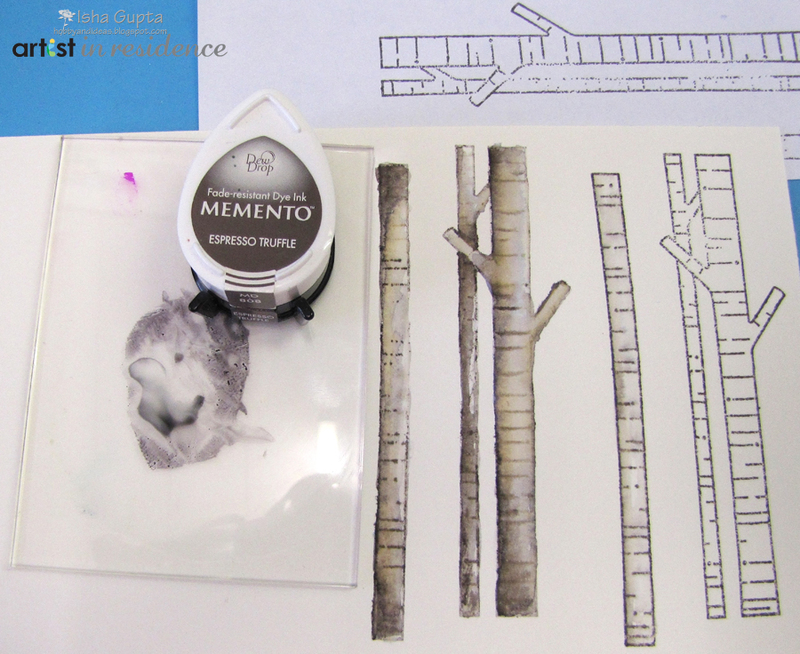 Our Artists In Residence were beyond excited to work with stamps and dies from our neighbor here in the Seattle area. Today we share with you two more creations from our AIRs using IMAGINE Crafts products along with some of the newest offerings from Memory Box. 1. Make 4 1/4″ x 5 1/2″ card base from black cardstock. 2. Cut another 3 3/4″ x 5″ panel from black cardstock. 3. 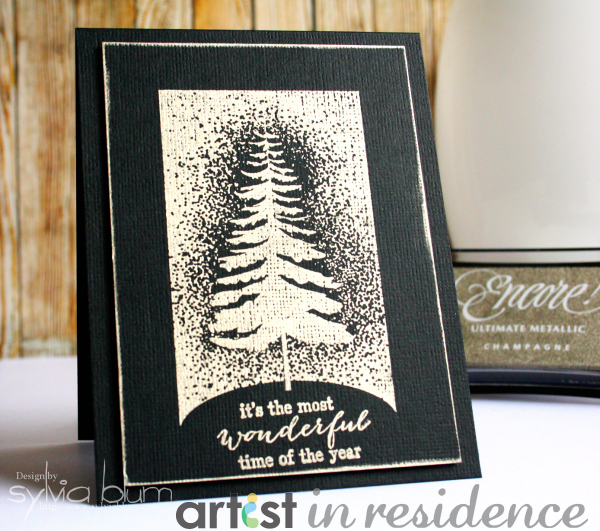 Stamp “Snowy Tree” with Encore! Champagne onto black panel. 4. Stamp “Wonderful Time” with Encore! Champagne beneath snowy tree onto black panel. Allow the ink to dry thoroughly! 5. Use an InkBlusher to edge the panel with Encore! Champagne and allow to dry completely. 6. Mount focal panel to card base using foam tape. 1. Cut white cardstock to 4 1/4˝x 11˝ and fold in half. 2. Cut white cardstock just a bit smaller than base card. Ink edges with Delicata Silvery Shimmer and heat set with clear embossing powder. 3. Stamp and heat set greeting near bottom, then attach the panel to card base. 4. Die cut Cabrini Ornament two or more times (I used 110lb card stock, so two is sufficient). 5. 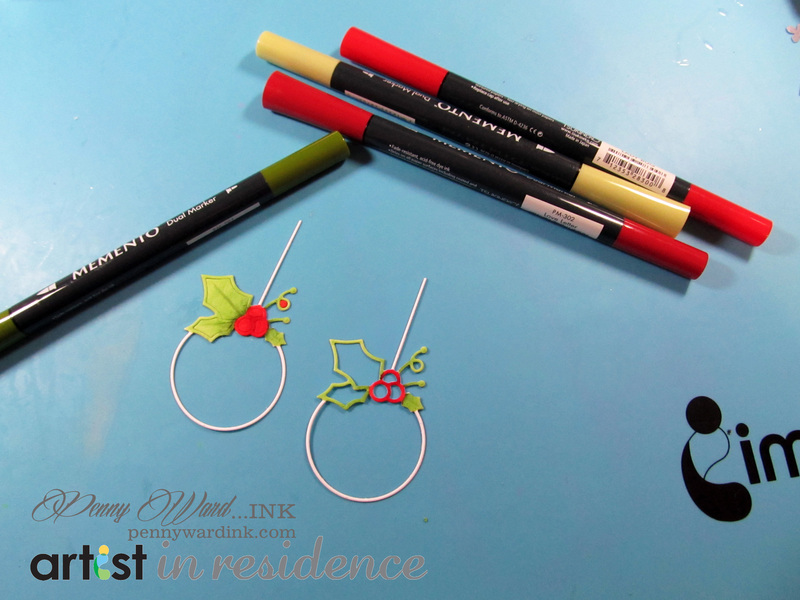 Color holly and berries with Memento Markers. 6. Spritz with Fireworks Pear Tart and allow to dry. 7. 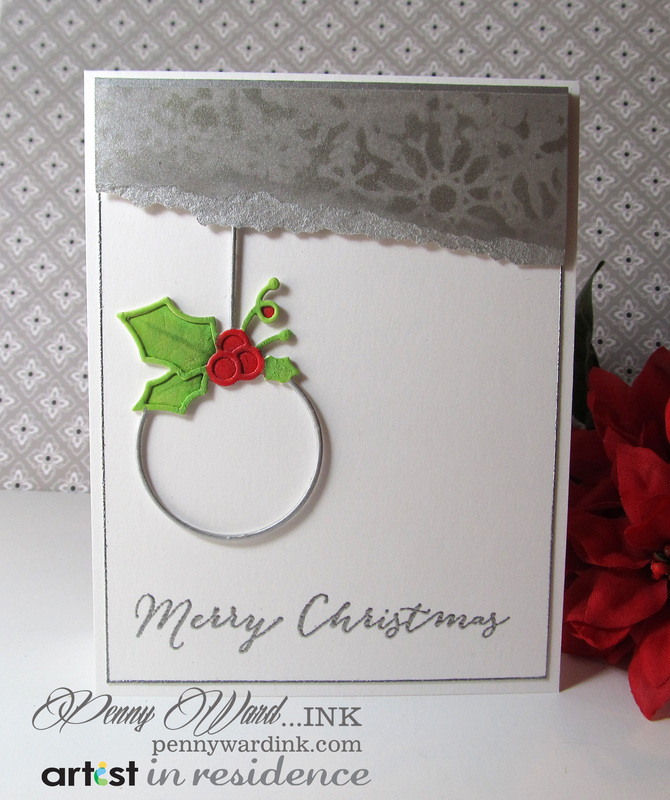 Ink round ornament and “string” with Delicata Silvery Shimmer. 8. Adhere die cuts on top of each other, then adhere to card front. 9. Cut white card stock 2˝ x 4˝ inches. 10. 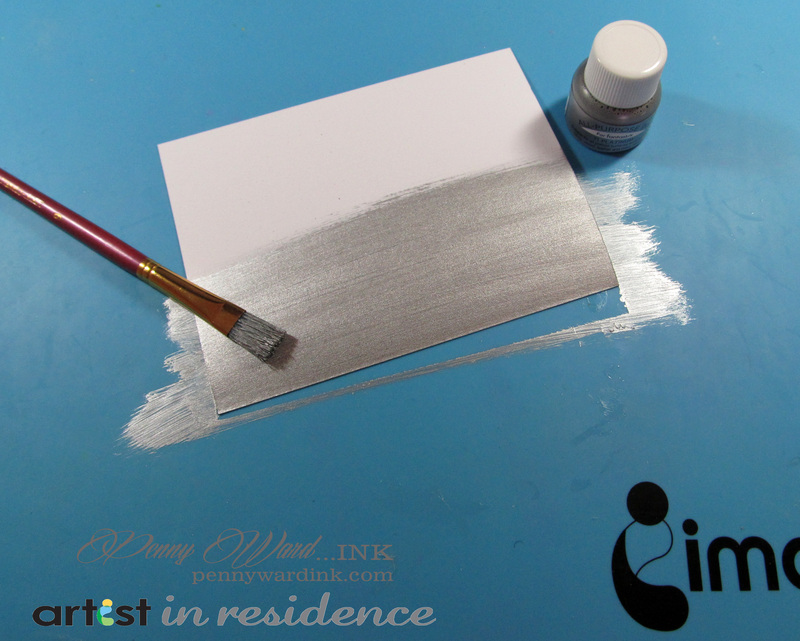 Paint this panel with Platinum All Purpose Ink and allow to dry. 11. 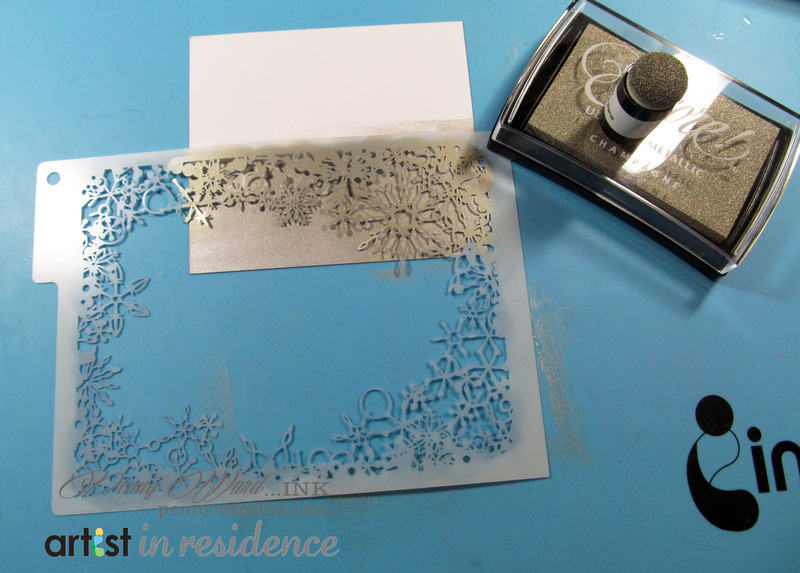 Stencil this panel with Winter Flurry Frame and Delicata Silvery Shimmer. 12. Tear panel along one long edge, ink with Silvery Shimmer, adhere to card top with foam adhesive. 1. Die cut two sets of ornaments from cream cardstock and once from chipboard. 2. Die cut an extra set of leaves from cream cardstock, along with a circle cut from acetate. 3. Ink the leaves with Cottage Ivy, then spray with Fireworks. 4. Use an InkBlusher to color the ornament ring with Brilliance Starlite Silver. 5. Color the die cut circle with Brilliance Rocket Red. 6. Stamp the sentiment with Memento Tuxedo Black on a scrap of paper, then fussy cut the words as desired. 7. Re-stamp ‘wonderful’ with Rocket Red and then spray with GooseBumps. Adhere over the previously stamped world with dimensional adhesive. 8. Sandwich the ornament layers together and glue. 9. Highlight the holly leaves with irRESISTible Wedding Dress. 10. 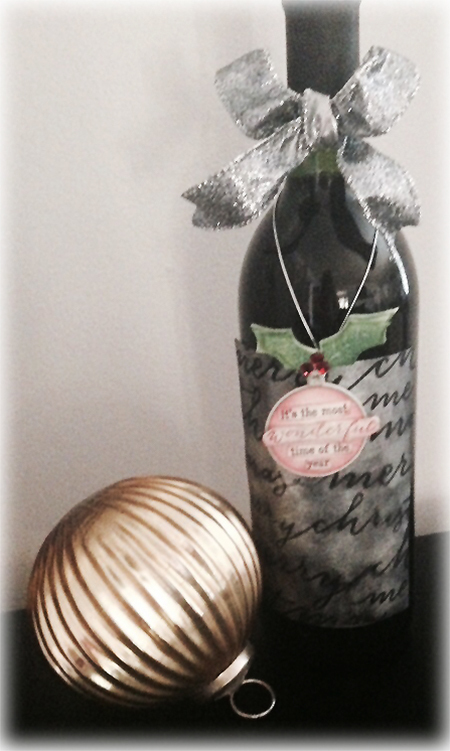 Cut a piece of black cardstock to size for the wine bottle label. 11. 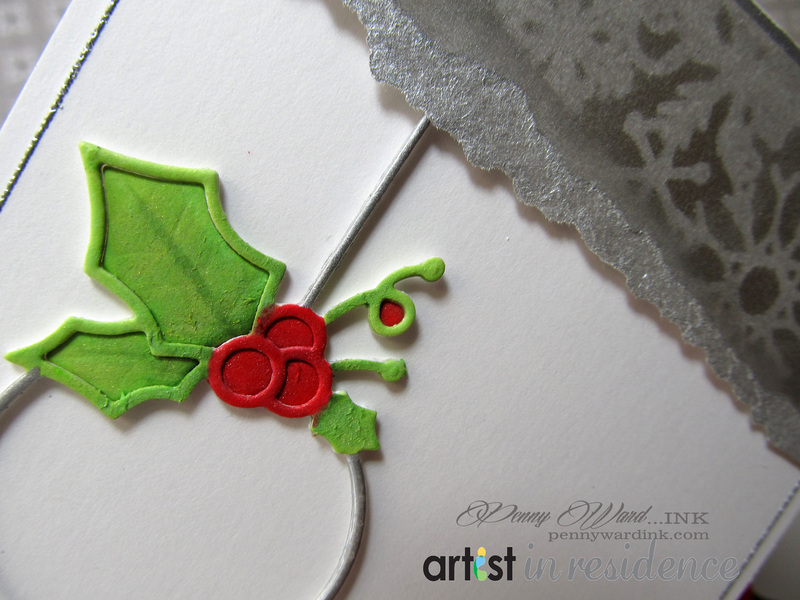 Using the Christmas Script stencil, ink with StazOn Metallic Silver. 12. Adhere completed label to the front of the bottle.